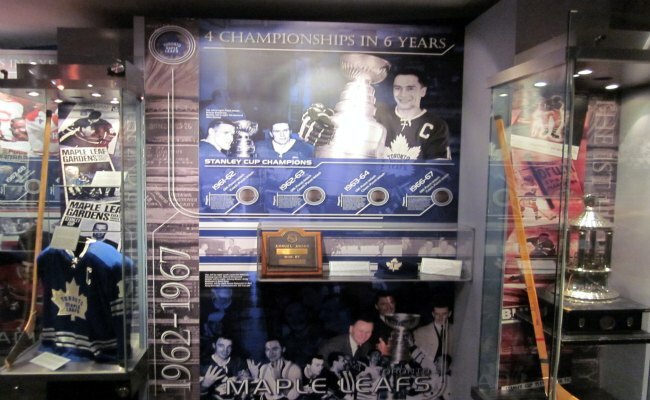 Toronto Hockey Hall of Fame is an excellent museum showcasing fascinating history of ice hockey. 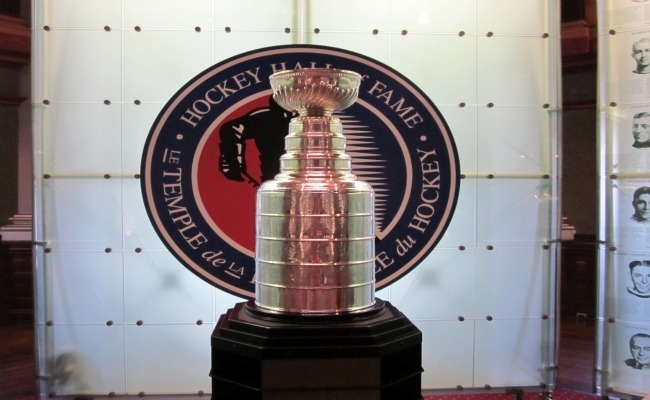 With breathtaking collection of hockey artifacts, memorabilia, awards and trophies, photos, life size statues and interactive games, the Hall of Fame is an indisputable paradise for any hockey fan. Spread over 60,000 square feet, the Hockey Hall of Fame features a large number of thrilling exhibits. 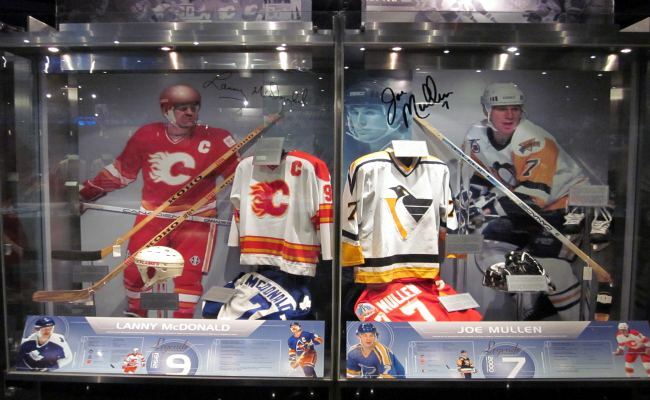 You will find an amazing selection of hockey artifacts from the NHL, IIHF, Olympic hockey, juniors and Women hockey. They've got it all! Watching the sticks used by legend hockey players, jerseys worn, pucks used in memorable games, goalie masks and other equipment is a spellbinding experience. You can challenge your shooting and goalkeeping skills at the state-of-the-art interactive exhibits. Or get up close and personal with the Stanley Cup in the Great Hall. Or enjoy a documentary film at the Hartland Molson Theatre. 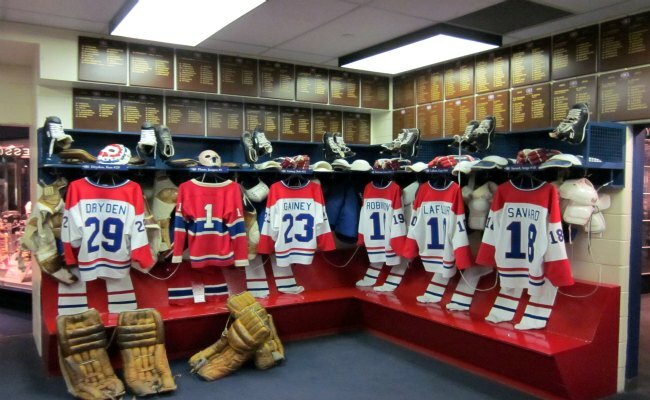 One of my favourite exhibits is a replica of Montreal Canadiens Dressing Room. The Hockey Hall of Fame is a great fun for everyone - kids, youths and adults. It's a wonderful place to visit, especially if you're a die-hard hockey aficionado. And this is just a sneak peak of Toronto's extremely popular attraction. Let's get the complete picture by exploring its appealing exhibits, multimedia theatres and game zone. 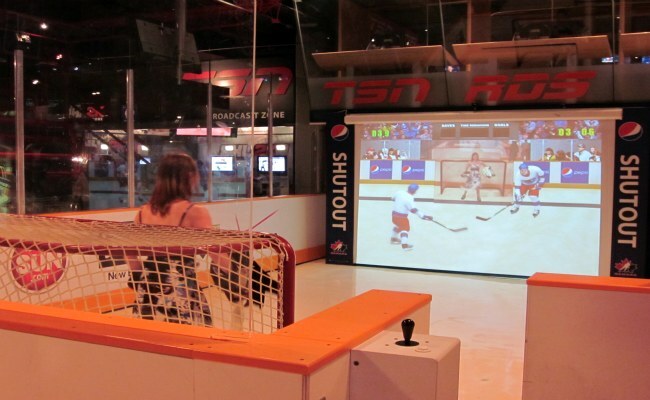 The NHL Zone is one of the new exhibits dedicated to the game's most popular league, The National Hockey League. This stylish exhibit features two nine-foot tall sculptures of Cyclone Taylor and Ken Dryden, various graphic and artifact displays of Hockey Hall of Fame Honoured Members, wide range of artifacts representing players and stars that are shaping the current game. Here you will find Stanley Cup Championship Ring and many of the NHL records through artifacts and graphic displays. Ever wonder how it feels inside the NHL team's dressing room? Check out the full-size replica of the Montreal Canadiens dressing room and experience it yourself. The replica is jam-packed with jerseys with players' names, sticks and other equipment, roasters of each team and portraits of great players who were inducted into the Hockey Hall of Fame. 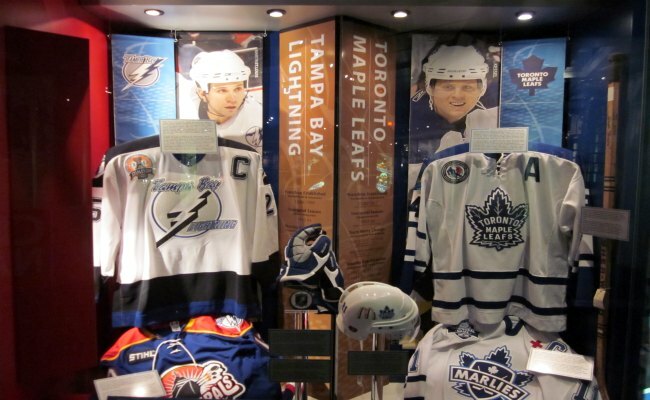 This exhibit showcases memorabilia from the list of nine franchises which conquered the premier NHL for several years in a short span. The roaster of franchises includes The Ottawa Senators of the 1920's, the Toronto Maple Leafs of the 1940's and sixties, the Detroit Red Wings of the early-fifties, the Montreal Canadiens of the late-fifties, the sixties and the 1970's, the New York Islanders of the early-eighties, and Edmonton's Oilers of the late-1980's. The exhibit offers a comprehensive timeline of the Stanley Cup's glorious history. In this small but modern theatre you can enjoy the documentary film showcasing evolution of the ice hockey - from its earlier days to the current excitement of the Stanley Cup. The current edition of the film titled 'The Stanley Cup Odyssey' features the 2010 Stanley Cup Final between the Chicago Blackhawks and the Philadelphia Flyers. The Panasonic Hometown Hockey exhibit is devoted to grass roots hockey in North America. 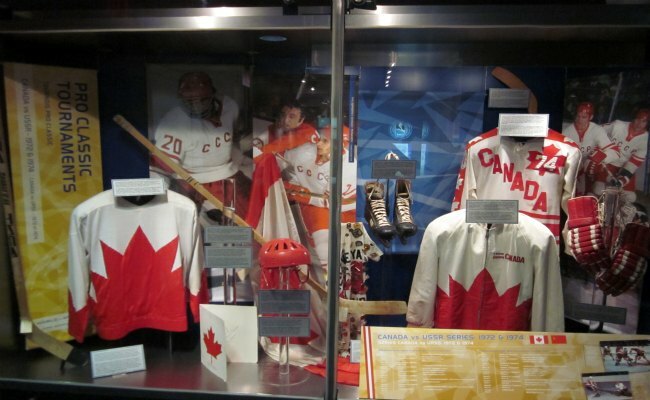 The expansive zone includes showcases featuring artifacts, photographs and historical information representing various leagues in Canada and US including women's and disabled hockey leagues. The 'Franchise Alley' is one of the Hockey Hall of Fame's newest exhibits and highlights the stars and history of each NHL franchise. There are tons of pictures and plaques commemorating great player and event in the games long history. 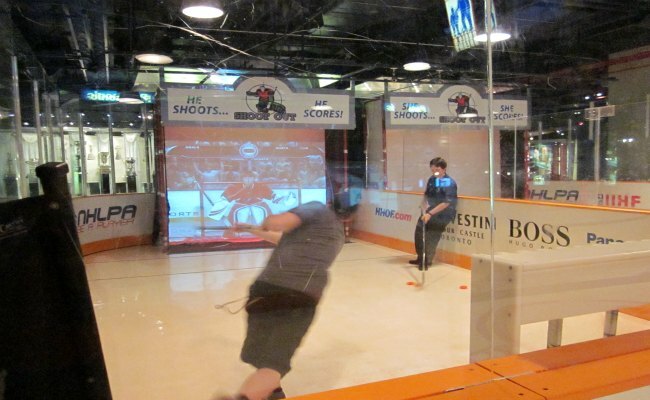 Test your hockey skills at the state-of-the-art interactive games inside the NHLPA Be A Player Zone's simulated rink. Grab your stick and smack the real pucks and see weather you're smart enough to beat a full-scale, computer-simulated goaltender. Another feature of this game allows you to test your skills by shooting on a specified number of targets. The other game allows you to do exactly opposite, playing as goaltender, blocking shots from computer simulations of best NFL shooters Wayne Gretzky and Mark Messier. You can enjoy a large variety of archival film and video footage from the Hockey Hall of Fame Archives including - Stanley Cup highlight and other unique hockey films and videos in the 120-seater, high-tech Esso Theatre. The World of Hockey Zone is the largest exhibit within the Hockey Hall of Fame and pays rich tribute to international hockey with an incredible collection of artifacts from around the world. 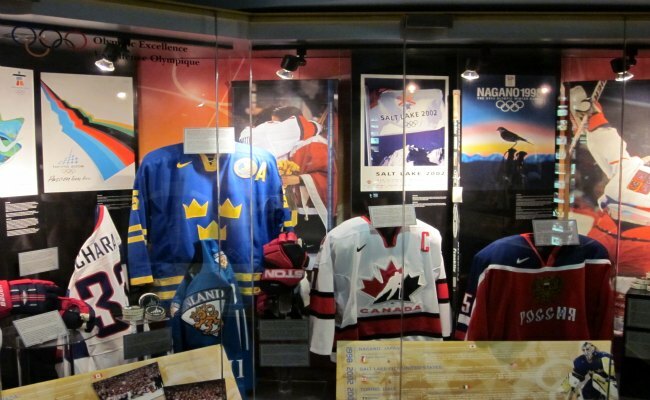 The major exhibits in this zone are The IIHF Hall of Fame and International Legends, The Triple Gold Club and The Top 100 Moments in International Hockey. The World of Hockey displays cover the European leagues, the World Cup of Hockey, the Canada Cup, the Olympic Games and many other significant worldwide hockey events. Without a doubt, the most coveted exhibit is the Verizon Great Hall - A Cathedral to the Icons of Hockey! Housed in an old Bank of Montreal building, the Great Hall has incredibly beautiful stained glass domed roof. And the NHL trophis and awards are definitely more elegant than the Hall itself! Here you will find the greatest collection of silverware in the world of Ice hockey, including the Vezina, Hart, and Calder, and the most famous and prestigious of them all the the Stanley Cup. You can actually touch the Stanley Cup and have your picture taken with it. Of course, it's not the real one. The original Stanley Cup is housed in the refurbished bank vault on the west side of the Great Hall. Really, the Hockey Hall of Fame is an amazing place dedicated to an equally amazing sport. The newly renovated Spirit of Hockey retail store offers a great selection of NHL, HHOF, Hockey Canada and other products. You can buy jerseys, caps, sticks, pucks, picture frames and many other souvenirs. 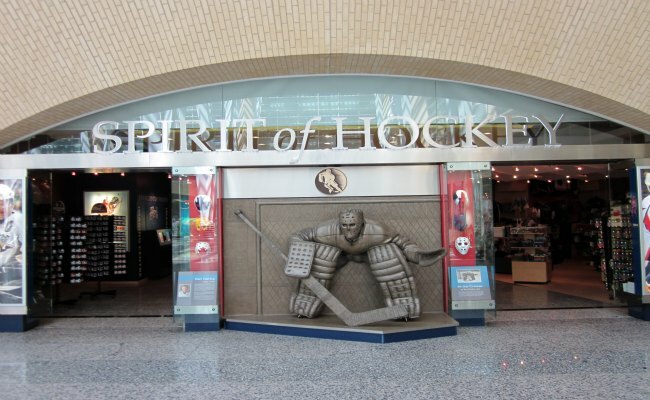 Tip - The entrance of the Hockey Hall of Fame is located in the basement of the Brookfield Place (formerly BCE Place). The door at the street level is locked. So you have to go into the Brookfield Place, follow the signs to the down escalator near the restaurant and find your way to entrance. The Hockey Hall of Fame is open every day of the year, except November 14 (Induction Day), December 25 (Christmas Day) and January 1 (New Year's Day). Tickets are available at the entrance of the museum. Take the Yonge-University-Spadina Subway to the Union Station in downtown Toronto. From Union Station, the HHOF is located just one block east at the corner of Yonge street and Front street. Hop the GO Transit train or bus to the Union Station in downtown Toronto. From Union Station, the HHOF is just a short distance away, located at the corner of Yonge street and Front street. From the South or West - Follow the QEW into Toronto, where it turns into the Gardiner Expressway. Take the exit toward Yonge Street and then merge onto Harbour St/Lake Shore Blvd E. Turn left onto Yonge Street. The HHOF is located at the corner of Yonge Street and Front Street. From the East - Take Highway 401 into Toronto and exit onto the Don Valley Parkway Southbound. As you approach Downtown, this will turn into the Gardiner Expressway. Take the Yonge Street N exit and turn right onto Yonge Street. From the North - Take Highway 400 into Toronto, exiting onto Highway 401 West. Continue until you reach Highway 427 southbound. Follow Highway 427 to downtown via the QEW/Gardiner Expressway. Take the exit toward Yonge Street and then merge onto Harbour St/Lake Shore Blvd E. Turn left onto Yonge Street. Parking: On-site parking is not available at the Hockey Hall Of Fame. However, there are several Green P parking lots available nearby.